I will never forget this wedding cake story. It seems funny now but at the time it was horrifying. Working as a wedding photographers assistant, I witnessed an abundance of strange behavior, usually influenced by alcohol consumption. At the reception everything was running smoothly. 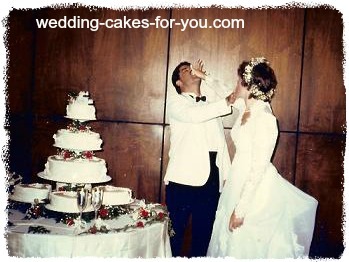 The cake had been cut, the bride and groom had fed each other lovingly, and the guests were being served dessert. The photographer decided it was the perfect time to get one more portrait of the bride and groom. While arranging them for the first pose, we couldn't help but notice the best man and the maid of honor sneaking up from behind, each of them carrying a piece of wedding cake. Imagine the horror as we realized too late that their plan involved smashing the cake into the happy couples faces from behind. The bride was in shock at first, followed by tears and finally anger at her best friend and maid of honor. The image of her face covered with cake, icing and tears is one we will never forget. She proclaimed that she would, "NEVER SPEAK TO HER MAID OF HONOR AGAIN". The celebrations came to an abrupt end but hopefully they lived happily ever after and patched up their friendships down the road!! !